This report examines the relevance and strategic positioning of UNDP support and its contributions to the country’s development from 2003 to 2010, covering two country programmes. 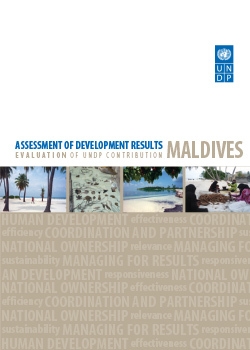 The evaluation found that in the past six years UNDP in the Maldives has coped with two major transformational events: the 2004 tsunami and the changes in political system. It concludes that UNDP has been particularly effective in its support at the policy level, especially in the area of governance, but less so at the atoll and island level. Gender equality and youth remain major areas requiring effective support while capacity development is the most significant barrier to sustained progress The evaluation states that UNDP country programme would achieve more with fewer interventions and a more strategic approach while taking into account the main barriers of weak policy and weak capacity.